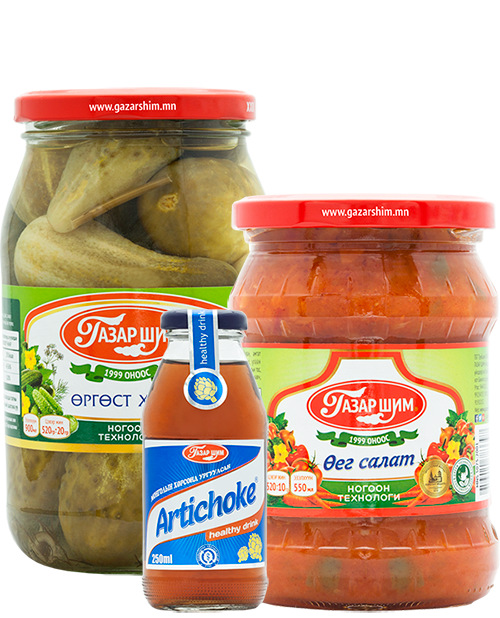 Our company was established in 1999, having started as the first factory for producing canned goods in Mongolia. At the starting year we produced 20000 canned goods under 2 types, but now we are producing over 5 million canned goods under 30 types of products making us the leader in the field. First few years we did seasonal manufacturing but, since 2007, our procedure was sustained and it made our staff more specialized, decreased the shortcoming of products, company output and sales are increasing. Also we are framing fruits and producing several types of compotes, jams and beverages that increased our types of production and quantity. Since 2008, “Gazar shim” factory made the “Health promotion program” making surveys and tests and the result was the “Artichoke” healthy beverage in 2011. We are planting the ingredients in Mongolia. Our factory in the years from 2007 to 2009 we have upgraded 80% of the production equipment, high-pressure, high-temperature sterilization in a fully automatic autoclave, mechanical autoclaves and other equipment installed in product assortment, improved quality, increased labor productivity and improved working conditions. And in 2013, we started a fully automatic beverage factory. Our company produces products by Mongolian technology and recipe. Also we do not add stabilizing or conservative elements so the products have to be used in a short period of time after being opened. Every year we are making and producing new products and increasing the outcome by maintaining the leading status in the market of Mongolia. The products are being sold at chain supermarkets, marketplaces and all around Ulaanbaatar city, and it’s being transported to the countryside as well.